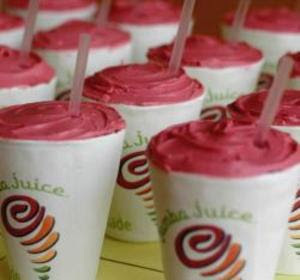 Summer Bliss is Back at Jamba Juice and it couldn't come at a better time. I don't know where you are, but where I am it is pushing 90°. There aren't many better ways to cool off than a nice cold smoothie, than hitting the beach or a pool. But then again, you could take a Jamba Juice smoothie to the beach or to the pool. It's a no-brainer. All you have to do is print this coupon and present it. The coupon is invalid 8/09/2009.